On a lark (or maybe a chukar? ), Russ and I decided to enter Carlin into the Lower Columbia HRC’s Upland test today. He’s been doing well with most of his training, so we read the rules last night, and thought, Well, why not? He probably won’t pass, but if nothing else, this would be an opportunity to train in a new place, among new people and dogs, and with a new agenda. And if he failed early enough in the day, we could just come home for lunch since the test was held only about an hour away from home. 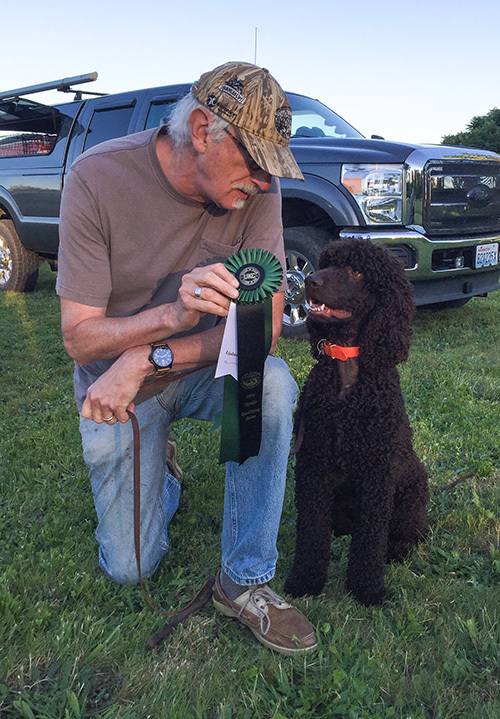 Most folks enter Hunting Retriever Club’s hunt tests to test their retriever skills. Similar to the AKC’s hunt tests, the HRC has three levels of retriever work: Started, Seasoned, and Finished. 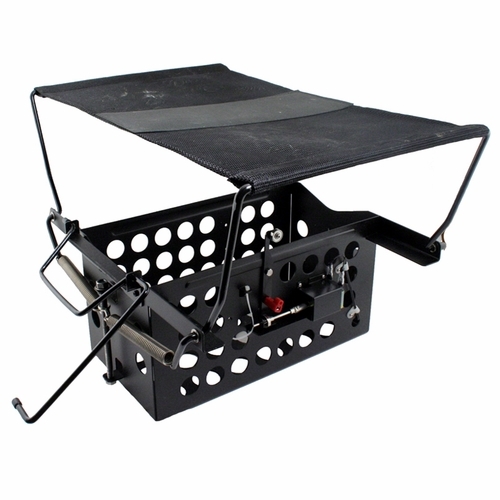 But they also offer an additional hunt test called Upland. It’s not an easy test. It consists of a quartering test with two flushes with steady to wing and shot, a walk-up and retrieve, an honor, and sometimes a tracking section. The quartering we figured he do OK at. He works a field well, but sometimes goes larger (and potentially out of shotgun range) from time to time. His flushing was likely to be good — he usually finds and either traps or flushes his birds. The steady to wing and shot could go okay, or not — he’s been mostly good at this lately, but not always. He’s never done a walk-up retrieve in his life — that’s where you walk forward with your dog at heel, and at some point, a bird flies (usually be mechanical means). At that moment, you stop, your dog stops and ideally sits, you aim your shotgun loaded with a popper and shoot basically a blank, and then you send your dog for the retrieve to hand. Carlin has never been asked to walk at heel off-leash with birds flying, and his retrieve to hand has been iffy for several months now. He’s also never honored. That’s where the dog has to sit and stay quietly at heel off-leash and watch another dog retrieve birds. 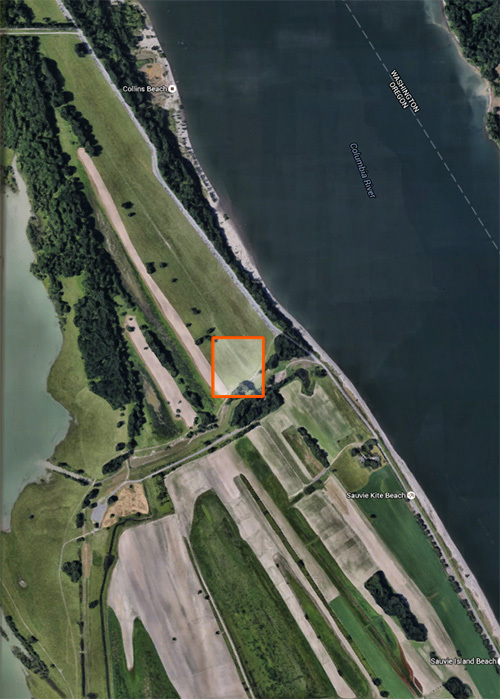 Today’s test was held on the east side of Sauvie Island (area indicated by an orange box). And here was today’s course. It was pretty low cover, about 8 inch grasses, interspersed with tall bushes and scotch broom. And the weather was nice, sunny in the low 70’s F and a light breeze. 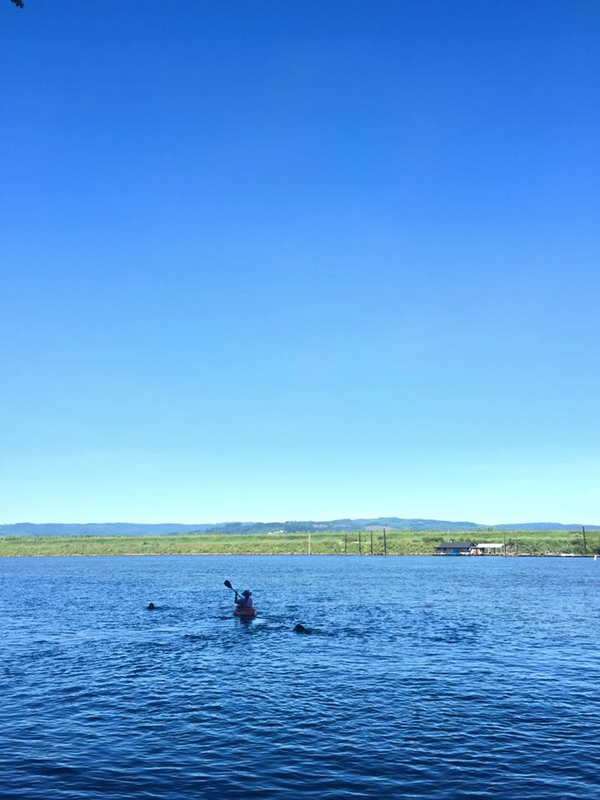 Carlin started the course in the holding blind point A. He was antsy in there, pulled on the leash, bounced around, and basically behaved like a beginning retriever puppy. Not a good omen. But as soon as Russ removed the slip lead, Carlin calmed down and heeled nicely off-leash with Russ to point B. There he sat quietly at heel, while the previous dog did his walk up retrieve from points F through I, H being where the dog left the line for the retrieve, picked up the bird at I, and then returned to his handler at H. Then that dog was leashed up and walked down the road past Carlin, while Carlin still sat quietly waiting at heel. It was an honor of at least 2.25 minutes. At that point, I didn’t care how Carlin did after that — I was just so gobsmacked by the fact that he quietly honored another dog. 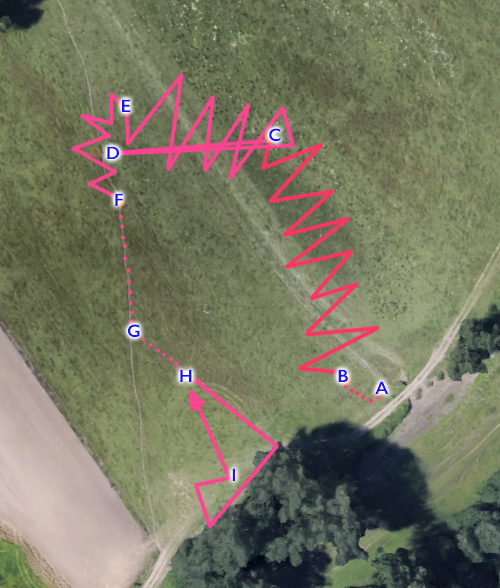 Then Russ and Carlin took off toward the first bird, which was at C, with Carlin quartering back and forth across the course. There was a gunner at each side, and Carlin quartered between them cleanly. He found the bird at C, and the bird took off west, where the gunner brought him down to fall at D. Carlin ran straight out and straight back, and the delivered the bird gently to hand back at C, where Russ was waiting. The course then curved a bit, and Carlin flushed up his second bird at E. It took off toward the gallery of watchers along the road, so the judges instructed the gunners to let the bird go, but fire a shot anyway in the opposite direction from the gallery. Carlin sat at the flush and stayed sitting for the shot. At that point, the judges instructed Russ to have Carlin quarter some more until he got to point F, and the walk-up began. Like I said, Carlin has never done a walk-up, and he was pretty sure he was supposed to be quartering, so Russ’s insisting that he heel was just confusing. He’d take off ahead a few feet to go out, but Russ would call him back, and he came back, but then would try leaving again. By the third repetition of this, Carlin must have figured that Russ had lost his mind, so he’d better stay close. So he did. He did a nice quiet heel from point G to H, where all of a sudden, a bird quietly flew out of nowhere (actually a cold chukar launched from a winger in the trees just south of point I). Russ stopped, and Carlin sat. Russ raised his shotgun and fired another blank toward the flying chukar, and Carlin still kept sitting. And then Russ sent Carlin, and Carlin took off. Unfortunately, Carlin didn’t know he was supposed to have been looking where Russ was pointing the shotgun (this is new for Carlin), and no sound had come from the winger like it does in an AKC retriever test, so Carlin didn’t mark the fall very well. But he hunted around, Russ gave him some direction (which he amazingly followed), and he finally located the bird, snatched it up, and returned it directly to hand. Then, just like the dog before him, Carlin was leashed up and walked down the road past the dog sitting quietly at heel at point B. Just as they were leaving the course, one of the judges said, “Nice pass.” The other judge commented that it was a pleasure watching Carlin run. And I agree — it was. I’ve been thinking a lot about Carlin, his coming into our lives, about another choice I could have made, and what I might do next time (assuming I am blessed with a next time). Cooper and Tooey were companions and friends. Together they were our two hunting dogs with different styles and different strengths (Cooper, the retriever; Tooey, the flushing spaniel). Then we got Carlin. We weren’t really ready or looking for another dog. That’s a key point. We weren’t looking. We had two wonderful dogs who gave us what we wanted, and around whom we had constructed our lives. We didn’t need another. But Carlin had a pedigree that I’d been hoping for — he came as close to being what a breeding between Cooper and Tooey would give us, I really like Harry (Carlin’s sire), and most of Carlin’s immediate ancestors have hunting test titles. So, even though we weren’t looking, we took Carlin on. It was trouble from the start. Cooper hated Carlin, so we had to keep them separated. The whole situation was very stressful. And plus, having three large, active dogs was just a lot of work and coordination for two adults who still work full time and live in a tiny inner-city house. And then Cooper died. “The mighty Coop,” as Russ calls him. We miss him every day, and remember how great he was. And that’s the second key point. As the days go by, we tend to forget how difficult he was in the beginning, how we wanted to trade him back into his breeder, how we sent him off for behavior training for six weeks to experienced trainers who also found him difficult, how it took YEARS to get him to do a nice heel, how we could never get him to be reliably steady to wing or shot, how impulsive he always was until the last weeks before his death. We remember what a great retriever he came to be, how he would bring Russ a matched pair of his shoes when it was time to go for a walk, how he was our hunting, performance, and photographic companion, and how he always brought back his birds no matter what. Carlin has his own strengths. He’s very affectionate, he actually likes Obedience, and he’s willing to consider alternatives to his own plans. Before the age of 2, he completed both his junior and senior titles in Spaniel hunting tests, well before the age Cooper even started training, and almost a couple of years before Cooper entered those same tests. But he’s not Cooper or Tooey. Unlike Cooper, he’s not a dog who lives to retrieve. Unlike Tooey, he would prefer to just run around in the field rather than hunt (though once he gets his running-around jollies out, he does hunt pretty well). Unlike both, his delivery to hand has regressed, so now he’s dropping birds, and we haven’t figured out a solution. Now I am thinking we should have waited to get a dog until Cooper had passed and we had finished grieving. Three dogs just doesn’t fit our life. And I suspect that we should not have gotten another Irish Water Spaniel. Comparing one dog to another dog is inevitable, but by getting another IWS, we made it too easy to compare Carlin to Cooper, too easy to expect Carlin to be like Cooper, and that’s just not fair to Carlin. No dog can be a replacement for another dog, the hole Cooper left is just too big, and darkness in that hole still obscures the light of Carlin’s unique self. A friend of mine had a wonderful Standard Poodle named Trip. Trip was a very impressive hunting Poodle. He had a talent for hunting and did very advanced work. 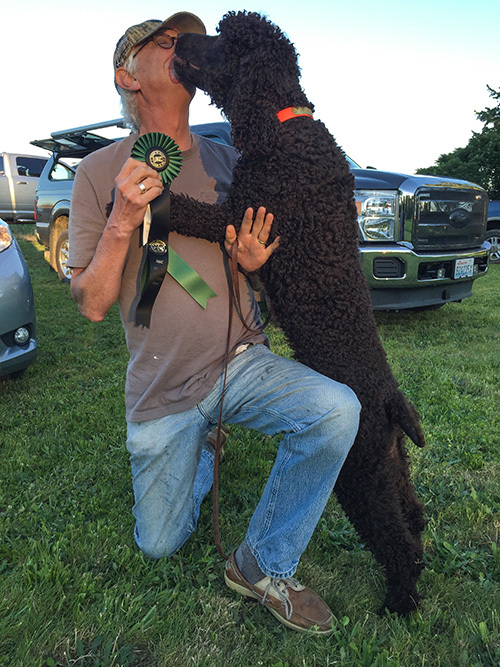 Then Trip died, and my friend got another Standard Poodle from working lines. But that dog is not Trip. It’s taken him longer to get not as far as Trip did in hunting. No doubt the dog has other fine talents and qualities, but he’s not Trip, and my friend said it took her years to get past that and just accept the new dog for who he is. So if we do have a next time, this is what I’m thinking now (assuming our situation hasn’t changed significantly): Wait for a while after Carlin or Tooey dies before getting another dog. Get a different breed, probably a Sporting/Gundog dog breed, but maybe a pointer or flushing spaniel. Maybe branch into some different activity, something that Cooper never did, but something that the new dog loves. Of course, if we do that, I’ll have to change the tagline on the blog. But I think I can deal with that.